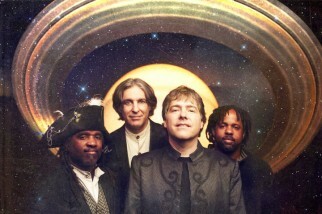 BELA FLECK AND THE FLECKTONES fuse bluegrass and jazz into “blu-bop”, a modern improvisational style. Frontman Béla Fleck plays acoustic and electric banjos and has been nominated for Grammys in the jazz, bluegrass, pop, spoken word, contemporary Christian, gospel, classical, and country categories. Brothers Victor Wooten and Roy “Future Man” Wooten form the rhythm section. Futureman – the group’s percussionist created the “drumitar” (a modified SynthAxe rigged to play percussion samples instead of a synthesizer), which is his innovation and contribution to the music. Harmonica and keyboard player Howard Levy appeared on the Flecktones’ first three albums. After Levy’s departure, Fleck and the Wooten Brothers regrouped on the album Three Flew Over the Cuckoo’s Nest. The band went on an amicable year-long hiatus throughout 2005, during which the individual members toured frequently in other configurations. The Flecktones were active and touring again in 2006. In 2008 the band released Jingle All the Way, their new holiday album. It received critical praise as well as one Grammy Award and one nomination in 2009. The Flecktones toured in 2010 with founding member and harmonica player Howard Levy for the first time in 18 years under the moniker “Béla Fleck and the Original Flecktones”. This year. Rocket Science, an album of new material with the original Flecktones lineup, was released to great critical acclaim.